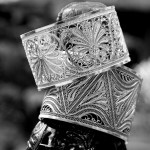 We are excited to host an exhibition of rare and exquisite Karimnagar silver filigree works from 6th September 2012 to 8th September 2012 between 10.30 am-6.30 pm. The exhibition also features a talk by Deepti Sudhindra (owner of The Jewelry Project) at 12 pm on 6th September. Deepti has a passion for reviving old metalsmithing techniques and using them to create exquisite filigree jewellery, which led us to work together with her on this event.